Not real art from Mario + Rabbids Kingdom Battle. This is in fact a Photoshop by Kotaku’s Riley MacLeod. Rabbids image via Wikia. Mario image via Wikipedia. One of this fall’s big Nintendo Switch games will be Mario + Rabbids Kingdom Battle, a game that has been rumored for quite some time and does indeed exist, as confirmed by art assets provided to Kotaku. 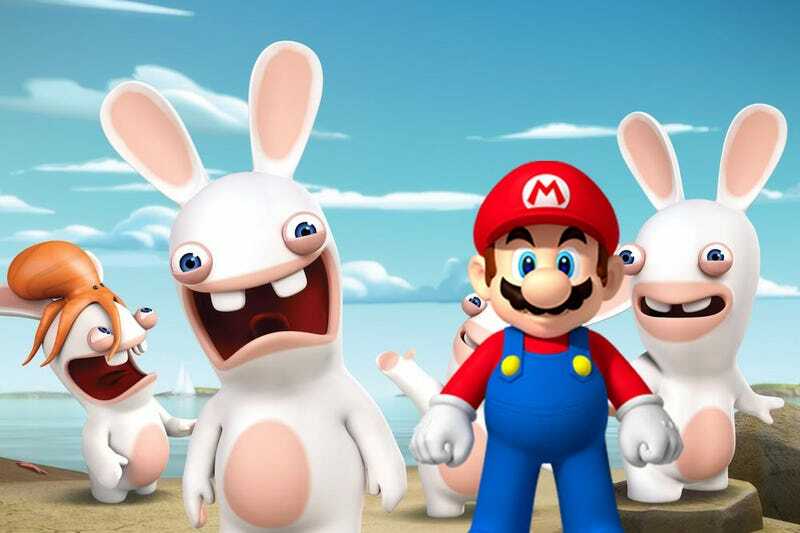 The game will mix Nintendo’s iconic plumber (and friends) with characters from Ubisoft’s popular Rabbids series. The game will apparently have eight playable characters: Mario, Luigi, Yoshi, Peach, and, bizarrely, four Rabbids dressed up as Mario, Luigi, Yoshi, and Peach. Nintendo and Ubisoft did not immediately respond to requests for comment.